Melee Earth Sword and Melee Darkness Sword, neutral BtH and base/rand leans. MC effect is that the weapon gets half normal stat bonuses of STR/INT divided evenly for damage (instead of just STR) and uses STR/INT for BtH stats instead of STR/DEX. 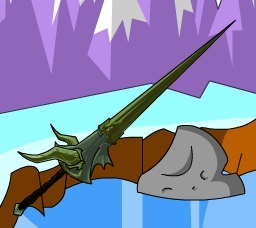 Is there any penalty for using these with an "incorrect" subrace like the other subrace weapons? After a lot of testing, it looks like at least the darkness Werepyre Blade is 0% proc. Is that a bug? The effect is cool, though unfortunately redundant with the armors. Can it please get a different MC in Werepyre forms? And a magic toggle, since it fits the theme? @Lord Markov These weapons don't have any sort of boost/penalty based on the subrace. Though it's worth noting these are MC, unlike the Vamp/Were ones. Yeah I guess I'm kind of trying to figure out whether this MC is supposed to be the replacement for not being required to wield as a werepyre (and hence having a correct subrace bonus) or if the MC is in addition to this, which would beg the question of why these weapons are different. Melee Earth Club/Magic Earth Staff, 1/3 base lean and +3 BtH lean for the club, neutral for the staff. Click the top of the weapon to call/summon a Nightbane guest. Guest has two regular Earth attacks usually, if you click his claw, it sets a toggle that has Nightbane instead do an attack that does half damage but heals the player for (DamageDone/MobsEarthRes). Either I misunderstand this post or the part where you click his claw is wrong. I just got the weapon and the guest with it and for the toggle you need to click Nightbane's head not his claw. Unsure if this should be posted here or in bugs though. Ice Dragons: +15% damage on all normal player attacks. Other Dragons: +7.5% damage on all normal player attacks. Ice Drakel/Dragonkin: +7.5% damage on all normal player attacks. Other Drakel/Dragonkin: +5% damage on all normal player attacks. Anything Else: -5% damage on all normal player attacks. This mighty copy of the great Dragon Blade uses Firestone to stabilize the dragonsbane! ...No, that doesn't mean it's made of tires. Numbers thank to Kamui. Trigger information thanks to Relinfearous. Image and description thanks to AliceShiki. June 13, 2018: The weapon was released. This magical, mighty copy of the great Dragon Blade uses Firestone to stabilize the dragonsbane! ...No, that doesn't mean it's made of tires. All normal Player attacks take -5 BTH but deal *85/80 damage. 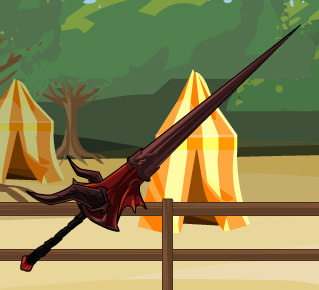 This fiery lance is wielded by the stronger members of the Dragon Slayer order. Its heavy weight makes it unwieldy, but it packs a punch, especially when facing Ice Dragons and their kin! Numbers thank to Kamui and In Media Res. Trigger and Mastercraft bonus information thanks to Relinfearous. Image and description thanks to AliceShiki. Corrections thanks to Poe. With 5 equally powerful hits, each hit does 1/5 damage. Special takes -5 BtH, but deals 85/80 damage. Notes: The Dragon Strike Lance does not have any visual trigger when the enemy is a dragon. Awarded to characters that achieved 1000 individual kills in the Dragons Gone Wild! 2018 war. Ranged Fire Lance, -5 BtH lean and 0.2 base lean. MC effect is basically a clone of the Ornate Dragon Blades. No downtrigger, +5% damage vs non-Ice Drakel/Dragonkin, +7.5% vs Ice Drakel/Dragonkin and non-Ice Dragons, and +15% vs Ice Dragons. All have no special, if you are a Guardian then the weapons gain an MC effect of +4.25 BtH on weapon/special attacks. Long Sword and Staff are neutral, Short Sword is +3 BtH lean and 1/3 base lean. Spear is also +3 BtH lean but is 2/3 random lean. All of them scale to PlayerLv -10 (min 0) for Adventurers, they scale to PlayerLv for Guardians, and if using the !!! version they gain a boost equivalent to a Guardian item (minimum of +3 levels). Kam says: Scales same as the Adv no-drops, with +3 BtH lean on dagger/spear, dagger has a 1/3 base lean and spear has a 2/3 random lean. Imry says: 10% Proc rate. The MC goes into PWD, but if you align it to have a not-random weapon special, then your special gets boosted. For the random Vampire, it looks at all possible Vampires that can occur, and chooses one. If no Vampires are possible, then it does Spiral Carve. SPIRAL CARVE: Standard special, 3 hits. If you're aligned to this, then it does +25% damage. AWE BLAST: 3 hits, always hits, does *0.85 damage. If you're aligned to this, then it does +25% damage. HEALTH VAMPIRE: If you're at 75% health or higher, then you do Spiral Carve instead. If not: One hit, x0.5 damage. You heal HP equal to the damage inflicted. If you're aligned to this, then you heal damage equal to 150% of the damage inflicted. Healing is divided by the monster's element modifier. MANA VAMPIRE: One hit, -5/6 damage (Magic) or -5/8 damage (otherwise). If it connects, you heal MP equal to [one standard Magic spell]. If you're aligned to this, then you heal MP equal to 1.4*[one standard Magic spell]. At the beginning, it checks whether or not this'll heal you above your max MP; if it does, then you do Spiral Carve instead. SOUL VAMPIRE: One hit, -5/6 damage (Magic) or -5/8 damage (otherwise). If it connects, you heal SP equal to [one standard Magic skill]. If you're aligned to this, then you heal SP equal to 1.4*[one standard Magic skill]. At the beginning, it checks whether or not this'll heal you above your max SP; if it does, then you do Spiral Carve instead. GUARDIAN DRAGON: Deals [17 + ([Your Level] - [MonLvl])/2]% of the monster's max HP as Harm damage. Has a 10% chance of calling Jr. instead, who deals [17 + ([Your Level] - [MonLvl])/2]% of the monster's current HP as [Monster base element] damage, and calls his dad after if the monster's resistance is lower than 50%. If you're aligned to this, then the weapon's proc rate increases to 12% (Magic) or 16% (otherwise). PWD: You know how it works :P If you're aligned to this, then the weapon's proc rate changes to 3% (Magic) or 4% (otherwise). This also happened to the golden quindent btw, it still says 3 hit special in its entry.